The Ottawa Senators made some progress in the standings when they beat the Montreal Canadiens 4-1 at Canadian Tire Centre Thursday. “Starting from that .500 mark and going from there is beneficial for us,” he added. The team is now a point back of the Canadiens who currently hold one of two wild card positions, but coach Paul McLean says there’s still work to be done. “That’s a good sign for us and we just have to keep continuing … come back here again tomorrow and continue to work at getting better,” he said. Robin Lehner made 33 stops and was a big part of the Senators’ victory. McLean said he liked what he saw from Lehner but maintained that Craig Anderson is their number one. Lehner said the team played better defensively over the past two games. Marc Methot #3 of the Ottawa Senators celebrates his second period goal against Francis Bouillon #55 and Tomas Plekanec #14 of the Montreal Canadiens with teammate Mark Borowiecki #74 at Canadian Tire Centre on November 7, 2013 in Ottawa, Ontario, Canada. 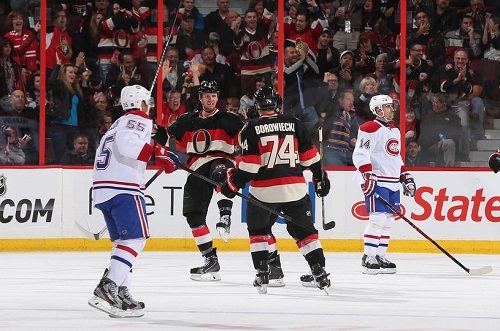 Mark Borowiecki, who was recently called up from Binghamton, scored his first career NHL goal in the win. “I think we’ve got a bit of a homestand too, here, so it’s nice to maybe get on a bit of a roll and build,” he said. Borowiecki was brought up to mix a different attitude into the dressing room. McLean said he’s doing just that. Ryan, who, despite having scored a goal and adding two assists, said some of the game didn’t feel right. The Sens did a great job in the face-off circle, winning 77 per cent of the game’s draws, but were outshot 34-24, and have now been in five of the six games they’ve won. Ottawa will continue their five-game home stint on Saturday Nov. 9 when they take on the 3-9-4 Florida Panthers at Canadian Tire Centre.